Once I learned to make the basic wire leaf shape, I really wanted to figure out to make different leaves. This shape is a little fancier since it has a center stem that can be left plain or have beads added to it. From a materials perspective, the exact amount of wire you will need to make a fancy wire leaf will depend in the size of the finished leaf you would like to make. My finished leaf is about 1 inch long. I used either 20g or 22g wire between 4-5 inches long for each leaf. In addition to the wire, you will need basic wire working tools such as chain nose pliers, round nose pliers, and flush cutters. A round mandrel is used to help make the rounded shape of the wire in the leaf sides. If you would like to decorate the leaf, you will need a small number of beads that fit easily on the wire. I used 8/0 seed beads for my decorated leaf. To start making the leaf shape, bend the wire 1.5 inches from the end. To make a pointy end leaf, use your chain nose pliers to press the folded piece of wire tightly together. Gently separate the two pieces of wire and shape them around a mandrel. The size of the mandrel will determine how round or long the finished leaf will be. Cross the two ends of the wire around the mandrel. Remove the wire from the mandrel and make any necessary adjustments to make the shape even. There will be one shorter wire, and a second that is about twice as long. The short wire needs to have at least a 1/2 inch tail. The extra wire is used to make a loop to hang the leaf and it is also used to secure the center wire of the leaf. Fold the longer wire over the short wire and down the center of the leaf shape. You can curve it slightly to conform to the shape of the sides. On the short wire, use your round nose pliers to turn a simple loop. Since this leaf is a little freeform, you don't have to go around in a perfect circle. I like to loop around with as much wire as I have to make it a little more organic and natural looking. To do this, grasp the end of the wire with the round nose pliers, and turn your wrist to wrap the wire around the plier. Continue turning until the loop is pressed tightly against the folded piece of wire. This is a picture of the back of the leaf. Use your fingers or tools to move the wire and press it firmly in place. You can trim the center wire, but make sure there is at least 1/4 inch of wire beyond the end of the center of the leaf. If desired, add beads to the center wire. Any beads that fit on the wire will work. Thread as many beads as will fit inside the leaf shape. Make sure the wire can still be pressed against the center of the leaf frame without pinching any beads or the beads will probably break in the next step. Adding the beads is optional. The last step to finishing the fancy wire leaf is to secure the center wire to the leaf frame. To do this, you will align it to the frame and find the point just past where the center wire overlaps the frame. Use your chain nose pliers to make a sharp bend in the wire. Continue bending the wire until it wraps over the frame wire. Use your chain nose pliers to flatten the bend around the wire frame and secure everything in place. Trim any extra wire and file the end of the wire using an emory board or file. The finished wire leaf looks great as a necklace pendant, bracelet centerpiece or as dangles in earrings. 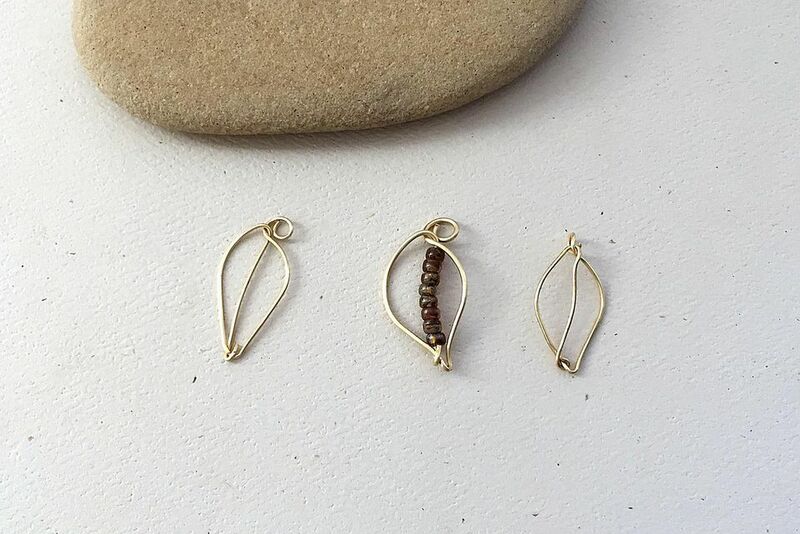 Once you have made the basic wire leaf shape, it is easy to experiment and make variations, Make a leaf with a more rounded end by following this tutorial. What Jewelry Making Tools Are Good for Beginners?